3/8" x 3" x RL., 30 sq.ft. / ctn. Hot Topics sale $3.45 / sq.ft. 3/8" x 5" x RL., 30 sq.ft. / ctn. Hot Topics sale $4.25 / sq.ft. 3/8" x 5" x RL., 25 sq.ft. / ctn. Limited residential warranty on all its product finish and structure. However, when you receive floor products, please thoroughly inspect all flooring products in each carton you ordered before permanent installation. The installer / Owner of pre-finished hardwood flooring have final inspection responsibility as to the grade, manufacturing and factory finish. They must use reasonable selectivity and hold out or cut off pieces with glaring defects, whatever the cause. Use of the manufacture care products or wax sticks for defect correction during installation should be accepted as normal procedure. When pre-finished flooring is ordered, 5% must be added to the actual footage needed as allowance for cutting, waste and mismanagement. Should an individual piece be doubtful as to grade or color acceptability, manufacturing or factory finish, those defect materials shall not be more than 5% of total. Hardwood Floors color variations are natural occurrence, may due to exposure to sunlight, and not exactly match the display samples. Inherent variations in grain or color are not considered as manufacturing defects. 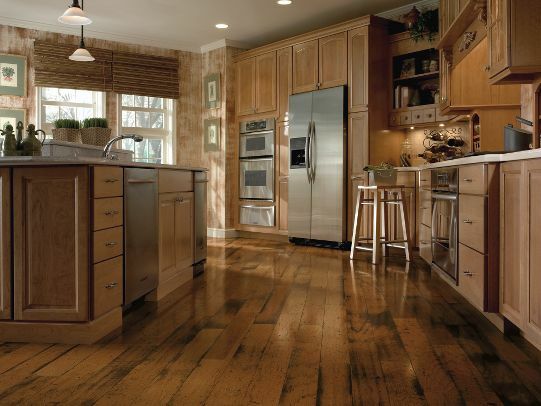 When it comes to the best in oak hardwood floors, Bruce Hardwood is a leader in the industry. Founded in 1884, Bruce is considered an industry leader in American solid-oak flooring because of its attention to detail and quality. The company was one of the first to offer pre-finished flooring to its customers and now offers an array of styles and colors to choose from. The wood's natural beauty is the key to Bruce's success, especially when it's married with oak's ability to retain its look and appeal for years.